The Earth has once again completed its orbit around the Sun, which for some reason means that we should all take stock of what we did over the past orbital period and post our top 10 whatever. Here at Kaedrin, we like things, so I'm thinking we'll post our top 40 beers. That sounds like a lot, but it's been a good year, and I've sampled at least 250 different beers, if not more. Plus, I stink at choosing favorites, and with something as varied as beer with all its disparate styles, I need some breathing room. Before we get to the big list, I thought I'd muse a bit on the themes of the year. This is, of course, more about me than the industry in general. But that's why you're here, right? Trading - Yes, I've dipped my feet into that most nerdy of pursuits, beer trading. Indeed, at least a few of the top 40 wouldn't be there if it weren't for some trades made this year, and I'm betting this will flow into next year as well. I don't see myself reaching the heights of the true beer nerds out there, but I'm sure I'll be getting ahold of more and more interesting beers in the coming year. Special thanks to Jay for kickstarting this new phase in my beer dorkery. 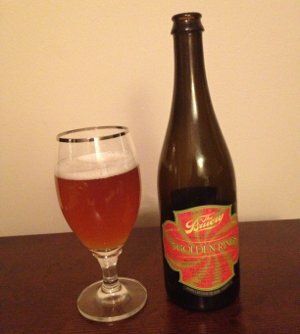 Sour Beer - Despite experimenting with sours over the past few years, I didn't fully buy in until this year. Naturally, these are beers that are expensive and harder to find, but I'm sure you'll be seeing a lot more in the way of sour beer in the next year or so. At the very least, I expect to hunt down some Cantillon and Drie Fonteinen, so it should be a fun year. 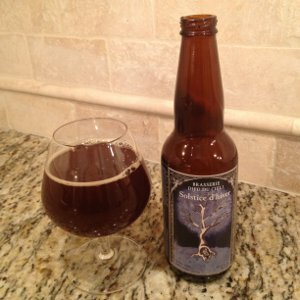 White Whales - When I first started this blog, I found it frustrating to read all these other blogs about beers that I'd never seen before or that weren't really available in the area. Well, that's changed somewhat, but then, so has the definition of "White Whale". I'm certainly not to the point where I'm going to start creatively misspelling them as .rar walez or anything silly like that, and the stuff that those trading nerds revere as wales will probably never made their way into my greedy paws (not that I'd mind, but still, those seem like tough beers to land). In the meantime, I'll have to settle for shelf whales and the like, but that's not a problem or anything. 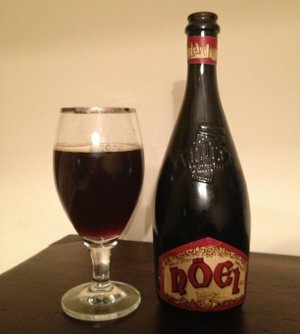 In a year where I got to try DONG (draft only, no growler) whales like Pliny the Younger, or pre-brick Westy 12 (tasted so much rarer back then), or witness the emergence of Tired Hands, I really have no room to complain and heck, I'm starting to feel a little bad about constantly reviewing beers that aren't that easy to find for the majority of the country. A little. Not that I'm going to stop or anything. Barrel Aged Beer - These continue to be a little obsession of mine, and that partly feeds into my newfound admiration for sours as well. That being said, bourbon barrel aged stouts and barleywines continue to be a favorite, and I've got some supposedly spectacular stuff lined up for 2013. Home Brewing - I actually only made 3 batches of beer in 2012, but two of them were fantastic, and the other is actually conditioning nicely and getting better as we speak. I would have probably made another batch at some point this year, but I was redoing my kitchen, so that didn't happen. My new stove, however, might help speed up the process. I guess there's only one way to find out. I'm actually hoping to try some more adventurous stuff in the homebrewing realm this year, so stay tuned. Aging/Cellaring Beer - I've mentioned a few times that my eyes are bigger than my liver, so my cellar has grown to be rather large at this point (this might be part of why I'm attracted to trading, but we'll see how that goes). Some of that stuff is aging intentionally, others will just take a while for me to get to. As mentioned above, I tend to favor drinking hoppy stuff right away at this point, but I've got some really interesting beer in the cellar that I want to get to ASAP. Others are things that I really want to age and find out how well they hold up. Only one way to find out, I guess. Hot damn, that was much more difficult than I thought it would be. I could have easily made this a top 50 without blinking, and those 10 that I left off could have muscled their way onto the above list if I were in a different mood. And heck, there are some superb beers I just recently had that haven't been reviewed yet - ¿Impending Descent? could have made the list for sure... but it'll have to wait til next year, I guess. Speaking of which, I'll see you then. Have a great new year! Beer Nerd Details: 9% ABV bottled (750 ml capped). Drank out of a goblet on 12/22/12. Beer Nerd Details: 8.6% ABV bottled (22 oz bomber). Drank out of a tulip on 12/22/12. Beer Nerd Details: 10.2% ABV bottled (11.2 oz). Drank out of a snifter on 12/23/12. Beer Nerd Details: 9% ABV bottled (11.2 oz). Drank out of a tulip glass on 12/26/12. A thousand pardons for the lack of pictures on two of these. I'd fire up MS Paint, but I'm no artist (read: I'm too lazy at the moment). You'll just have to use your imagination. This, more or less, wraps up the holiday beers for this year, but don't you worry, I've got plenty of facemelting stouts and barleywines on the way, wintery to their core, and perhaps a few IPAs and sours as well, just to keep things interesting. Stay tuned. 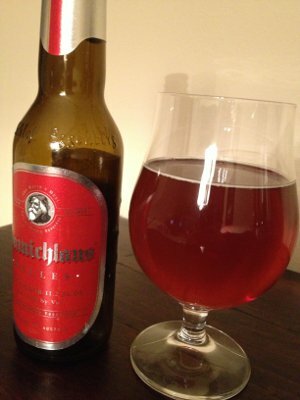 I discovered Samichlaus a few years ago and immediately sought out some bottles to lay down in my cellar. Breaking out a vintage bottle on Christmas eve whilst I belatedly wrap presents is quickly becoming one of my favorite Christmas traditions. Last year, I cracked open bottles of both 2009 and 2010 and was quite impressed with how well the age treated the 2009 edition. Today's beer was actually bottled in 2007, but it's also the Helles version of the beer. Helles is German for "bright" and this beer is supposed to be a paler version of the traditional Samichlaus, but the trouble with this is that the beer has such a high original gravity that the end result looks more or less the same as the traditional variety. Back in the day, Michael Jackson noted that: "In recent years the brewery has accepted the traditional view that Christmas and winter beers should be dark." This translates to the fact that the brewery only puts out the Helles every four years. However, it appears that they haven't completely given up on the idea, as I've seen 2011 bottles around. Beer Nerd Details: 14% ABV bottled (11.2 oz). Drank out of a tulip glass on 12/24/12. Bottled in 2007. At this point, I regret not loading up on the 2007 when I could. But I still have a few bottles of the 2009, and each year thereafter. So let's just say, you'll be seeing this every year. Beer Nerd Stats: 6% ABV bottled (22 oz. bomber) Drank out of a tulip glass on 12/15/12. Special thanks to my new pal Joe in Chicago who slung these Three Floyds beers my way. Look for more reviews in the near future, including some Top 100 heavy hitters. Modern artwork associated with the song typically depicts five bands of gold, like rings you'd wear on your finger. And 5GR is no exception, it's not obvious at first, but the swirl of the label is made up of repetitive groups of interlocked five rings. But as I somewhat alluded to last year, the song is about preparing for a Christmas festival, with the first seven verses describing birds (game or otherwise) that were being brought to the festival as food. In this case the five golden rings referring to five male, ring neck pheasants. Beer Nerd Details: 11.5% ABV bottled (750 ml capped). Drank out of a goblet on 12/14/12. So my Bruery-fueled, liver-destroying, wallet-lightening, amazing-beer-filled winter continues. If I can clear some time off my schedule to knock back one of their true monster beers, I'll have a review of that coming soon. And I'm sure I'll hit up that bottle of Cuir that's been in my cellar for a while too. Might as well just make this a full year of Bruery, instead of just a winter. 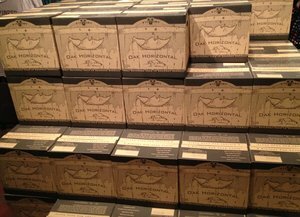 Lately, it seems like all of Dogfish Head's beers have gone off the deep end. I know they're fond of "off-centered" stuff and strange ingredients, but a lot of that stuff doesn't seem to pique my interest. I guess it's interesting that someone is making beer with "an ancient form of wheat and loaves of hearth-baked bread, and it's flavored with chamomile, doum-palm fruit and Middle Eastern herbs", but I dunno, that's just not revving my engine. Maybe I'm just a man of simple tastes. 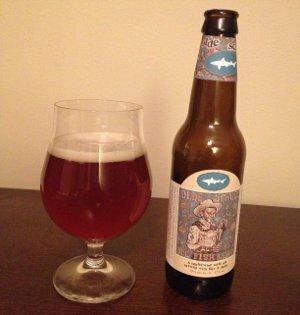 I tend to prefer Dogfish Head's more normal takes on standard styles, like IPAs (made with far out ingredients like... hops!) and stouts. 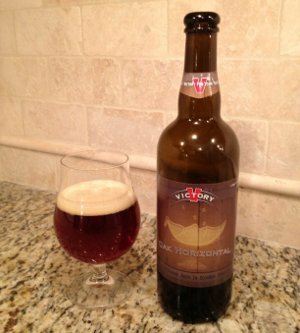 This barleywine offering straddles the line a bit, but it at least sounds like it's beer. Beer Nerd Details: 15% ABV bottled (12 oz.) Drank out of a tulip glass on 12/8/12. Bottled in 2012B. Label sez: "Directions: Open bottle, pour contents into two snifters. Enjoy. Or: Walk hand-in-neck into the middle of the woods. Use a shovel to dig a 2x2 hole three feet deep. Seal the bottle in a plastic bag. Place in hole & pack with dirt. Memorize location & leave. Return exactly one year later. Dig up bottle, open & enjoy." I suppose that's a romantic notion. I have another bottle of this stuff, but I think I'll just let it sit in my cellar for a while, along with some 120 Minute and World Wide Stout. Maybe I'll crack another one of those in a year or two. 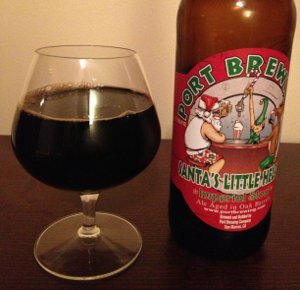 Port Brewing's Santa's Little Helper is a solid, if unremarkable, imperial stout. I've had it a couple times, and it's fine, but I always feel like I'm missing something. Perhaps what I was missing... was bourbon! Beer Nerd Details: 10% ABV bottled (22 oz. bomber) Drank out of a snifter on 12/8/12. Vintage 2012. In case it hasn't been clear from the frequent posts about Tired Hands, I've been spending a lot of time there. This was partly brought on by the fact that I'm redoing my kitchen and thus have had times when I had no way to cook anything, but it's also probably due to the fact that Tired Hands is pretty fantastic. 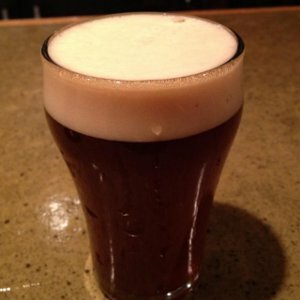 As a brewpub, they basically have a constantly rotating list of offerings (with only two consistently available). As such, I can't really keep up with everything, even as often as I'm visiting, but that won't stop me from trying. Here's some thoughts on some recent visits. Many of these are 4 ounce pours, and I didn't take detailed tasting notes for a bunch of them, so pedants might want to take this with a grain of salt. Let's get to it, shall we? Tired Hands Weedeater - This is a Double IPA made with Galaxy and Amarillo hops. Yum. Tired Hands Westy13 - Described as a dark saison, this is a beer that's really grown on me. I've had it 3 times now, each time a 4 ounce pour, but each time feeling like I could easily put down a couple 8 ounce glasses. Which, at 13% ABV, makes this a dangerously drinkable beer. So there you have it. Always something interesting going on at Tired Hands. 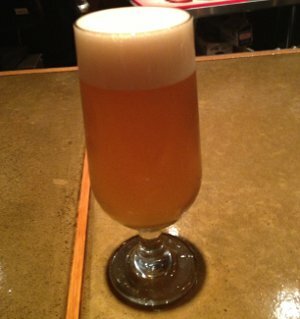 Up next for me is their Singel Hop Saison, Motueka (another New Zealand varietal), which just went on tap this week. Some other upcoming stuff sounds interesting, including Falco's Nerd Flight (IPA brewed with Galaxy, Amarillo, and Falconer's Flight hops), MotherAnimal (a barleywine conditioned on coffee beans), and Good Yule (a strong "holiday saison", whatever that means). It's been a while since I've played Belgian beer roulette, so I figured I'd take a flier on this beer, cryptically designated a "Grand Cru". Just what is a Grand Cru, you ask? That's an excellent question; it doesn't mean anything. In wine, the phrase is clearly organized and regulated. It refers to the highest level of vinyard classification. Something about terroir. I don't know, what is this, a wine blog? The point is that while it's formally defined for wine, it was basically adopted in the beer world as a marketing tactic. Most beers labeled as Grand Cru seem to be imply that it's a style, but that's not at all the case. 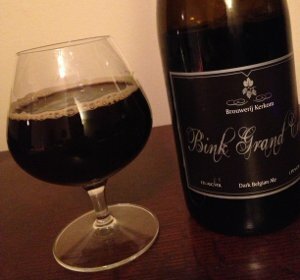 You can get a Belgian Strong Pale, like the 9.5% ABV Southampton Grand Cru, or today's beer, Bink Grand Cru, which is a 13% ABV Belgian Strong Dark monster, or even Rodenbach Grand Cru, which is a sour Flanders Red weighing in at just 6.5% ABV. That's a pretty disparate range of flavors and styles right there. 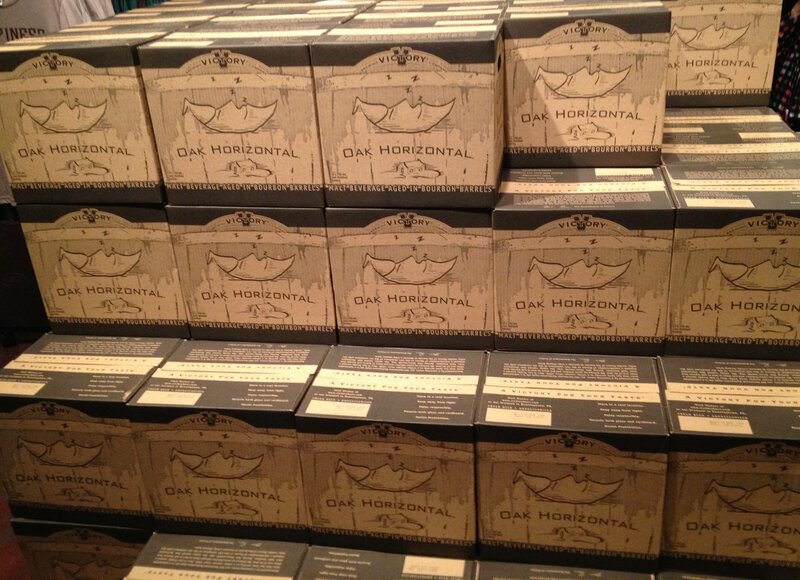 Beer Nerd Details: 13% ABV bottled (750 ml caged and corked). Drank out of a snifter on 12/7/12. This actually reminded me a little of Tired Hands' Westy 13, though it's got a more chocolate and booze component than Tired Hands' brew. Ok, so maybe it's just that they're both 13% and dark and rich. Still, both are excellent. Another successful session of Belgian Beer Roulette, and I live to play again.